We have just completed the release of version 2.3 build 002 of DynDevice on the whole Mega Italia Media cloud. 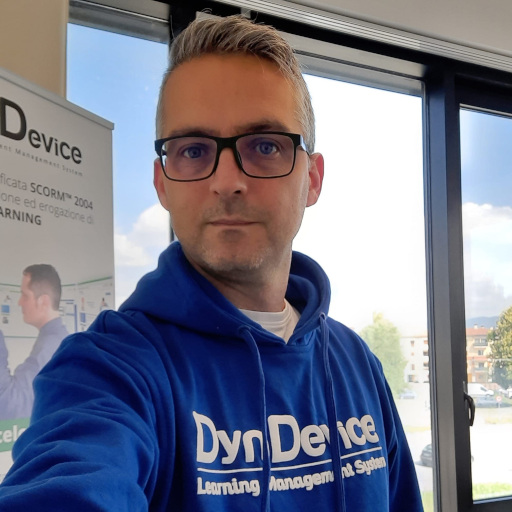 DynDevice is the complete training management system equipped with e-Learning platform, SCORM™ editor (LCMS with authoring tools), HR management, web content management and company intranet management. • In the "PDF certificate attached" notification you can now use the IFs <if-draft> and <if-complete> to have different email text according to whether it is a draft or complete certificate. These IFs can also be inserted in the visual editor by embedding them into a HTML comment (<!-- <if-draft> --> e <!-- <if-complete> -->). Editing results of advanced tests. If the logged in user is a LCMS (not group) administrator, the "Force user answers" link is now available in the window. This features enables the editing of test answers and any previously-assigned scores. Updated scores can be manually inserted in the dedicated field or automatically calculated by the system via the "Calculate score" link. • During training drills and advanced tests, a check is now in place to disable forced logout even when a user spends more than 30 minutes on the same page. Importing users via CSV with "Active" flag. It is now possible to set the value of the "Active" field for each learner when importing users via CSV. • The "Contract" field can now be renamed in "Platform options -> Labels". The [Import users] function of solution 1. Training management can now also be accessed from the menu of solution 4. HR Management. • the "Exit document" field is now saved on the server with a crypted name. "Users with no medical visits" function. The menu has been enhanced with a new[Users with no visits] button which displays all users with no assigned/uploaded medical visit. The button has a small red square showing the number of users in the group. This function can also be used to set up recurring e-Mail alerts. The[Generate report] function has been added to medical visits, to enable the extraction of group-filtered lists of completed/booked medical visits and users with no medical visits. More options in the "Medical Visits" field. • A new field labelled "Medical centre" (with "all" or specific medical centres as value) has been added just below "Medical visits". This field's drop-down menu is activated once "Upload of outcome" is selected in the "Medical visits" drop-down. • All windows of solution 4. HR management have been updated to reflect the increased number of options. Administrators in 4. HR management. When a new administrator-level user for solution 4.HR management is created, all HR-related fields in the user rights table are now automatically set on TRUE. Window for displaying skills and course GAPs. Extension of employee personal data. 19 new fields have been added to the table of employees/learners: "gender", "legally protected category", "Skill type", "Career Level", "First day of employment", "Start of path", "Detailed pipeline status", "Start of training", "End of training", "Activate internship", "Renew internship", "End of internship", "Mentor "company tutor)", "Company ID", "Referring recruiter", "Deployed to entity orglvl1", "User location", "Create" and "Last edit" (these last two are read-only and automatically filled by DynDevice). The import system for employees/learners now checks whether the "Contract" field is textual instead of numerical and converts into an appropriate numerical ID any such contract value into an appropriate numerical ID (creating the appropriate "Contract" if it doesn't already exist). Courses can now be labeled "Alternative to" two courses instead of just one (e.g. a "classroom training" 8-hour session which replaces both "General training" and "Specific training"). The transfer of enrolments between users (user merging) now also transfers any information on medical visits. • in-use operator filters when opening a ticket's detail are now preserved when "Back to list" is clicked. The "Other active session" screen in English has been improved. • administrators are now given the option to receive a daily report of employees who skipped their lunch break and therefore had an "uninterrupted" day of work. Activity checks for employees with part-time 6 hours contracts have been optimized.